The Horsemen begin to muster, with Death raising corpses and preparing to strengthen the four with new forms. Mr. Terrific informs Batman and Superman of the situation, and briefs them on the powers of the corpses as they watch the country struggle to solve its problem without involving the outside world. On Oolong Island, Veronica Cale reveals that they've been granted sovereignty, and puts I.Q. in charge of the project she's crafting (presumably to defeat the Four Horsemen) after a subordinate fails. She talks to Calculator about monitoring what Checkmate has on the situation, and orders the formerly failing subordinate to insert eyes and ears into Bialya, redeeming him. Superman scans the situation, and returns to Batman with the distressing news that corpses are preparing a large "hive" for the Horsemen. Inside, the Four Horsemen assemble their new bodies as corpses guard them. The hive begins to reverberate, and rats emerge. Superman insists on taking Batman out of the situation. Batman refuses, so Batman drops him instantaneously into a desert, plowing into the fray before being taken down by famine, struggling not to consume corpses. At the last second, Wonder Woman pulls him out of the fray. In the desert, Batman, Superman, and Wonder Woman meet to prepare an attack. In the desert, watching from afar, a man puts down his binoculars. It's Snapper Carr. Story - 5: Why are they promoting the hell out of Countdown with stories like this brewing in the background? This is, by far, one of the better stories coming out of DC right now for me. I mean, it's even making Snapper Carr somewhat cool looking. That's... wow. You know, it's not even the story, so much, which is rather normal. It's the attention paid to the detail, the character, the thinking through of the beats. It's something you don't see much of in DC lately. I'm really enjoying this story. Another critic, after reading the first issue, remarked that the plot was pretty by the numbers, in terms of introducing each character and not going somewhere with it. I read that after I read my last review and agreed, to a degree, but gave the story the benefit of the doubt, given that I knew the writing was solid, and that a good introduction can lead into a great story. Early on, I used to jump on a story in the first issue for not revealing too much, but time's kind of tempered me in this regard, and this story is a good example of that. I could kind of see where it was going, and they brought everything together in the second issue's beginning and started with the dilemma, which pleased me. It could have gone either way, and it went great. Most six issue minis feel arbitrarily stretched, they really do. This is like a piece of venison, no fat, meaty, goodness. I guess what I'm saying is that though I know the plot isn't really that imaginative (Four Horsemen as a concept is beaten to death), the story is dragging me right along. Veronica Cale finally treated with respect. Superman, Wonder Woman, and Batman working together without trying to be cute, and yet with humor. An actual reason why only three heroes are battling a massive threat. 52 elements. Home run all the way, so far, and I'm really eager to see where this goes. Art - 4: Still rocking, PARTICULARLY the scene where Wonder Woman sweeps in and saves Supes. It was unexpected, and the art made what was a good writing beat an incredible moment. I culled one point because of the fact that I wasn't sure it was Calculator (and still find myself a bit confused), but that's not reflective of the quality. It's five art. It's got the run and feel of 52, and it's a royal blast. It's not flashy, but it's doing the job. Cover Art - 5: I know you probably didn't notice this, but look at that cover. Eh, right? 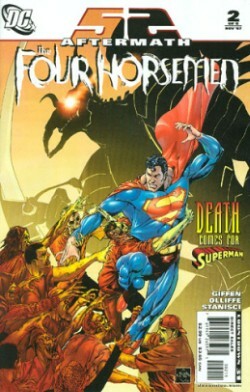 Then look at it as a takeoff of Superman, issue 1. I didn't see it for some time, and then, when I finally did, wow. Even beats the downer of having words on the cover. Awesome silhouette in the back, too. I dig it.